Depending upon number of weighing heads, this EASY PAC packaging equipment is named as single head (one head), Twin head (two heads), three heads & four heads. The speed of twin head is double the single head & the speed of four head is double the twin head or four times the single head. EASY Pac packaging machine can handle virtually all kind of free flowing solids. 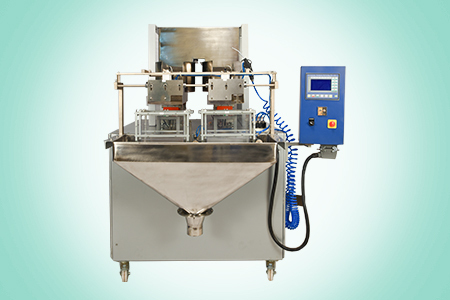 This packaging equipment handles grocery items such as rice, pulses, chana dal, toor dal, sugar, wheat, tea powder, green peas, white mutter & similar products without any change parts or making changes in the settings, one can keep on toggling with different materials & different target weights on the same packing machine. Thanks to “Self learning software” developed by our R & D team. This machine has Two weighing Head & Open Hopper of 100 liters of capacity. Product characteristics Free flowing granules solids. Air requirement 1 HP, 8 Bar pressure, 2 CFM. *Depending upon products and grammage.